Sesame Oil, Gelatin, Glycerine, Sorbitol, Water. 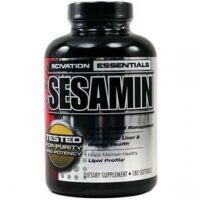 Diminishes acne Aids fat loss Sesame seed burps This is an excellent product, I've been taking this for about a year now, and have seen great improvements in my BMI. Aside from the fat loss, I've battled acne since I was 13, I am now 18. This product has almost completely diminished the problem and makes my skin smooth. In that aspect, I have to give this product a 10/10.